Directed by Stephen Hopkins. Produced by	Karsten Brunig, Luc Dayan, Kate Garwood, Stephen Hopkins, Jean-Charles Levy, Nicolas Manuel, Louis-Philippe Rochon, and Dominique Seguin. Written by Joe Shrapnel and Anna Waterhouse. Release date: February 19, 2016. Based solely on its story, Race should be a real winner of a movie. At the 1936 Olympic Games - which were held in Berlin, Germany, while the Nazis were in power - track and field athlete Jesse Owens, a Black man, wound up winning four gold medals, essentially giving a big middle finger to Hitler and the rest of the Nazis. That's a pretty cool story, and the best part is that it actually happened. All you have to do in order to make a good movie out of it is give us some background on Owens prior to the event, show how he overcame the racism of the period, and then have some thrilling races at the end. It's a story that feels tailor-made for an inspirational and impactful biopic. Race, while not terrible, is underwhelming, overlong, and fails to live up to that potential. 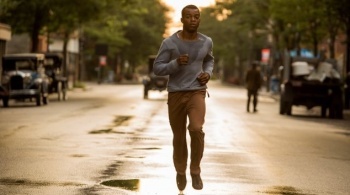 Owens is portrayed by Stephan James in a performance that is better than the movie in which it is contained. Owens came from a poor background and was the first in his family to get into university. He decided to go to Ohio State University in order to train under Larry Snyder (Jason Sudeikis) with the eventual goal of competing in the Olympics. While there, he dealt with racism, but ultimately did go on to compete in Nazi Germany in 1936. It takes Race over two hours to tell this story, and there's very little else that you'll learn about Owens in that time. I guess that's not fair. He had a wife, Ruth (Shanice Banton), with whom he has a daughter, who at first doesn't want to marry him because he cheated on her, but then does marry him because, well, he said "pretty please." And he almost didn't want to go to Berlin because he was urged not to in order to send a statement regarding the discrimination taking place both at home and abroad. But outside of that? There isn't much here. 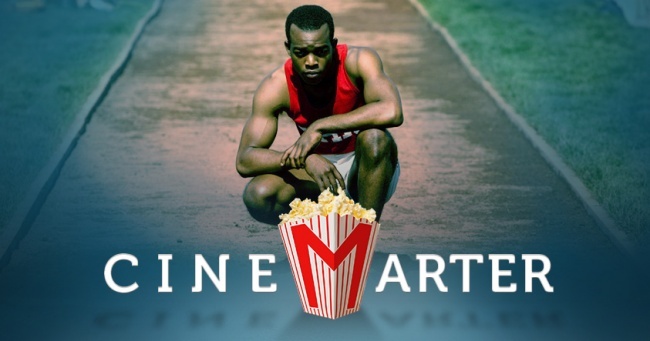 This version of the Jesse Owens story is lacking in detail and depth about its protagonist. Oh, Owens is front and center for most of the film, but we don't actually learn a whole lot about him or his life. Reading a single Wikipedia page is significantly more informative. So, then, what does Race have going for it? Well, it shows us the politics of the era through Avery Brundage (Jeremy Irons), a prominent member of the United States Olympic Committee, who fought tooth-and-nail against a complete boycott of the Olympics - even going to Germany in order to ensure that the United States' demands were met. We get to learn a decent amount about Larry Snyder, Owens' coach. And, perhaps most interestingly - and interestingly - we watch how Leni Riefenstahl (Carice van Houten) fit into the 1936 Olympics. She, in case you didn't know, directed Olympia, which documented the Games. She was also the Nazis' chief propagandist - Triumph of the Will was her film - and defended Hitler on several occasions - even though the exact nature of her relationship with the party is still unclear.